College tuition in the United States is the privately borne cost of higher education collected by educational institutions in the United States, excluding the portion that is paid through taxes or from other government funds as supply-side subsidies to colleges and universities, or demand-side subsidies to students, or that is paid from university endowment funds or gifts through scholarships or grants. 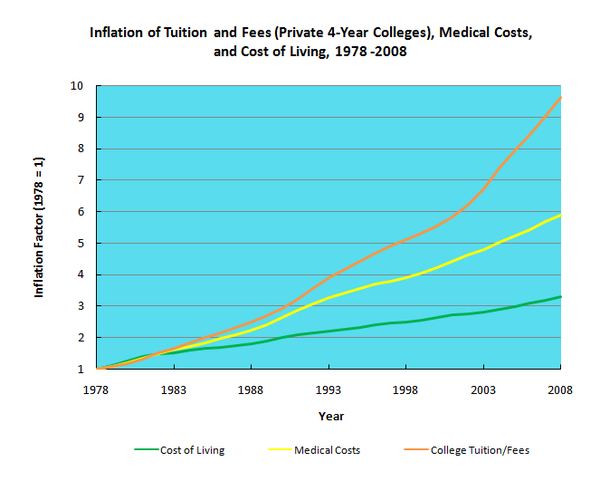 Tuition for college has increased as the value, quality, and quantity of education has increased. These increases have occasionally been controversial. 2 Overview of tuition rates in the U.S.
College attendance increased dramatically after World War II with the introduction of the GI bill and greater federal funding for higher education. University based research was believed to have played a critical role in determining the outcome of WWII, and was believed to be essential for success in the Cold War. With the launch of the Sputnik satellite by the Soviet Union, many feared that the United States was falling behind on science and technology because it relied on private wealth to fund higher education, whereas the Soviet system was believed to be generously publicly funded, more meritocratic, and more closely tied to the needs of the economy and the military. Many families were unable to borrow sufficient funds to finance a high quality education for their children, and to thereby increase their children's earning capacity and standard of living, until after the introduction of federal student loans. As public subsidies fell and costs and quality of education increased, loans played an increasingly important role in higher education finance. Except for its military academies, the U.S. federal government does not directly operate and control higher education institutions. Instead it offers loans, grants, tax subsidies and research contracts. Land grants date back to the Morrill Act during the U.S. Civil War and direct grants to students date back to the "G.I. Bill" programs implemented after World War II. Overview of tuition rates in the U.S. The United States has one of the most expensive higher education systems in the world, and also one of the most successful in terms of the boost to earnings from higher education. Public colleges have no control over one major revenue source — the state. In 2016-17, the average cost of annual tuition in the United States ranged from $9,700 for public four-year institutions to $33,500 for private four-year institutions. Private colleges increased their tuition by an average of 1.7 percent in 2016-17, the smallest rise in four decades, according to the U.S. Consumer Price Index. Between 2007-08 and 2017–18, published in-state tuition and fees at public four-year institutions increased at an average rate of 3.2% per year beyond inflation, compared with 4.0% between 1987–88 and 1997–98 and 4.4% between 1997–98 and 2007-08. One cause of increased tuition is the reduction of state and federal appropriations to state colleges, causing the institutions to shift the cost over to students in the form of higher tuition. State support for public colleges and universities has fallen by about 26 percent per full-time student since the early 1990s. 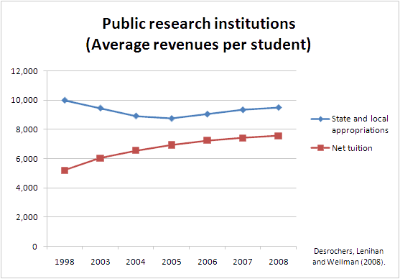 In 2011, for the first time, American public universities took in more revenue from tuition than state funding. Critics say the shift from state support to tuition represents an effective privatization of public higher education. About 80 percent of American college students attend public institutions. Critics also note that investments in higher education are severely tax disadvantaged compared to other investments. Heavy taxes and inadequate subsidies to higher education contribute to underinvestment in education and a shortage of educated labor, as demonstrated by the very high pre-tax returns to investments in higher education. The view that higher education is a bubble is controversial. Most economists do not think the returns to college education are falling. To the contrary, they appear to be both increasing, and to be much higher than the returns to other investments such as the stock market, bonds, real estate, or private equity. One rebuttal to the claims that a bubble analogy is misleading is the observation that the 'bursting' of the bubble are the negative effects on students who incur student debt. For example, the American Association of State Colleges and Universities reports that "Students are deeper in debt today than ever before...The trend of heavy debt burdens threatens to limit access to higher education, particularly for low-income and first-generation students, who tend to carry the heaviest debt burden. Federal student aid policy has steadily put resources into student loan programs rather than need-based grants, a trend that straps future generations with high debt burdens. Even students who receive federal grant aid are finding it more difficult to pay for college." The nonpartisan New York Fed studied the effect of increased loan supply on tuition following large policy changes in federal aid program maximums available to undergraduate students that occurred between 2008 and 2010" found "that institutions that were most exposed to these [loan limit] maximums ahead of the policy changes experienced disproportionate tuition increases around these changes, with effects of changes in institution-specific program maximums of Pell Grant, subsidized." However, many empirical studies that have tested the effects of student loans on college tuition find no evidence of an increase in tuition, especially net of scholarships and after taking into account increases in the quality of education funded by increases in tuition. Moreover, the widespread availability of private student loans makes it unlikely that public student loan availability limits demand for education. An additional rebuttal to the student loan theory is the fact that even in years when loan limits have not risen, tuition has still continued to climb, and tuition has increased more at public institutions than at private institutions. Public college tuition has jumped 33 percent nationwide since 2000. One recent working paper posted online by the Federal Reserve Bank of New York in 2015 (revised in 2016) concluded that undergraduate institutions more exposed to increases in student loan program maximums tend to respond with modest raises in tuition prices. The working paper has not yet been subject to peer review. A third, novel theory claims that the recent change in federal law removing all standard consumer protections (truth in lending, bankruptcy proceedings, statutes of limits, the right to refinance, adherence to usury laws, and Fair Debt & Collection practices, etc.) strips students of the ability to declare bankruptcy, and, in response, the lenders and colleges know that students, defenseless to declare bankruptcy, are on the hook for any amount that they borrow -including late fees and interest (which can be capitalized and increase the principal loan amount), thus removing the incentive to provide the student with a reasonable loan that he/she can pay back. However, changes in the availability of bankruptcy discharge for private student loans caused no changes in the pricing or availability of private student loans, suggesting that this theory is implausible. The practice of 'tuition discounting,' in which a college awards financial aid from its own funds. This assistance to low-income students means that 'paying' students have to 'make up' for the difference: increased tuition. According to Inside Higher Ed, a 2011 report from the National Association of College and University Business Officers explains more about the practice of tuition discounting. The article notes that "while the total amount spent on institutional aid for freshmen rose, the average amount that institutions spent per student actually dropped slightly," and gives, as one possible reason for this drop, that between 2008 and 2011 "colleges and universities had to lower the amount they gave to each student to help cover a larger number of students." According to Mark Kantrowitz, a recognised expert in this area, "The most significant contributor to tuition increases at public and private colleges is the cost of instruction. It accounts for a quarter of the tuition increase at public colleges and a third of the increase at private colleges." Kantrowitz' study also found that "Complying with the increasing number of regulations — in particular, with the reporting requirements — adds to college costs," thus contributing to a rise in tuition to pay for these additional costs. Since deregulation, the average cost of tuition and fees at the state’s public universities has increased by 90 percent, according to the Texas Higher Education Coordinating Board. Of the 181 members of the state’s 83rd Legislature, more than 50 have voted at least once to advance efforts to end tuition deregulation, while fewer than 20 have consistently voted to uphold it. Many have never voted on the issue, and more than 40 members are freshmen. This rise, however, is not entirely negative. Tuition increases help universities make up for that in their budgets. Colleges and universities have accumulated multibillion-dollar endowments, especially at elite universities. Harvard University announced its endowment was worth $32 billion, and Yale reported an endowment of $19.4 billion on returns that were tax-exempt. In 2011, California's two public university systems had more than $7 billion in endowment funds but raised tuition fees by 21% combined. These figures raise related concerns about "institutional gap" — meaning that universities may not be managing their endowments appropriately and that other universities try to compete with elite institutions, thus charging higher tuition fees in the competition to retain high faculty- and status-ranking. Increase public funding for higher education to offset tax disadvantages of investments in higher education compared to other investments. State and federal governments should increase appropriations, grants, and contracts to colleges and universities. Federal, state, and local governments should reduce the regulatory burden on colleges and universities. Minimize the risk of investment in higher education through loan forgiveness or insurance programs. The federal government should enact partial or total loan forgiveness for students who have taken out student loans. Tax the endowment income of universities and link the endowment tax to tuition rates. Colleges and universities should look for ways to reduce costs without reducing quality. Federal lawmakers should return standard consumer protections (truth in lending, bankruptcy proceedings, statutes of limitations, etc.) to student loans which were removed by the passage of the Bankruptcy Reform Act of 1994 (P.L. 103-394, enacted October 22, 1994), which amended the FFELP (Federal Family Education Loan Program). Cut lender subsidies, decrease student reliance on loans to pay for college, and otherwise reduce the 'loan limits' to limit the amount a student may borrow. Think tanks that are covertly funded by entities with close ties to private student lenders have advocated scaling back federal student loans because this will increase the price that private lenders can charge and will expand the amount they can lend. In support of these arguments, think tanks have made claims that public (but not private) student loans lead to tuition increases and an oversupply of educated labor. Most economists are skeptical of these claims. Lawmakers should reduce Federal aid. Regulatory or legislative action to lower or freeze the tuition, such as Canada's tuition freeze model, should be enacted by federal lawmakers: Economists generally believe that price controls lead to shortages and inefficiency. "The National Center for Education Statistics should increase the frequency of the National Postsecondary Student Aid Study to annual, from triennial, in order to permit more timely tracking of the factors affecting tuition rate increases. Likewise, NCES (National Center for Education Statistics) should take steps to improve the efficiency of the data collection and publication for the Digest of Education Statistics, so that all tables will include more recent data. The most recent data listed in some tables is five years old." "The US Department of Education should study the relationship between increases in average EFC (Expected Family Contribution) figures and average tuition rates. In addition, it would be worthwhile to examine how historical average EFC figures have changed relative to family income when measured on a current and constant dollar basis for each income quartile." "Disproportional inflation" refers to inflation in a particular economic sector that is substantially greater than inflation in general costs of living. Cost of living increased roughly 3.25-fold during this time; medical costs inflated roughly 6-fold; but college tuition and fees inflation approached 10-fold. Another way to say this is that whereas medical costs inflated at twice the rate of cost-of-living, college tuition and fees inflated at four times the rate of cost-of-living inflation. Thus, even after controlling for the effects of general inflation, 2008 college tuition and fees posed three times the burden as in 1978. Most economists believe that the benefits of higher education exceed the costs by a wide margin and that higher education more than pays for itself. There is concern about the investment in higher education because of excessive taxation of educated labor and inadequate subsidies. Besides economic effects of rapidly increasing debt burdens placed on students, there are social ramifications to higher student debt. Several studies demonstrate that students from lower income families are more likely to drop out of college to avoid debt. Families who are classified as middle class are at risk because due to the increasing cost of college tuition will be limited in their education and training that allows them to succeed in their communities. Studies indicate that more than 75% of college students report stress, including stress involving tuition challenges Recent reports also indicate an increase in suicides directly attributable to the stress related to distressed and defaulted student loans. The adverse mental health impacts on the student population due to economic-induced stress are becoming a social concern. Students generally have higher stress levels on their financial burden such as student loans, and foreseeable employment in the job market. A closely related issue is the increase in students borrowing to finance college education and the resulting in student loan debt. In the 1980s, federal student loans became the centerpiece of student aid received. From 2006 -2012, federal student loans more than doubled and outstanding student loan debt grew to $807 billion. One of the consequences of increased student borrowing is an increase in the number of defaults. During this same time period, two-year default rates increased from 5.2 percent in 2006 to 9.1 percent in 2012 and more than doubled the historic low of 4.5 percent set in 2003. Since data collection began in 1987, the highest two-year default rate recorded was 22.4 percent in 1990. In 2012, the U.S. Department of Education released detailed federal student loan default rates including, for the first time, three-year default rates. For-profit institutions had the highest average three-year default rates at 22.7 percent while public institutions rates were 11 percent and private non-profit institutions at 7.5 percent. More than 3.6 million borrowers from over 5,900 schools entered repayment during 2008-2009, and approximately 489,000 of them defaulted. For-profit colleges account for 10 percent of enrolled students but 44 percent of student loan defaults. In 2011, the Project on Student Debt reported that approximately two-thirds of students who graduated with bachelor's degrees from 4-year nonprofit universities had taken out student loans with an average debt of $25,250, an overall rise of five percent from 2009. In 2010 student loan debt surpassed 'Credit Card' debt. Student debt in the United States has reached $1 trillion, almost a 50% increase from 2008. As a result of the student loan and tuition crisis, studies have shown that students are experiencing stress under the current economic downturn and fiscal challenges. In his 2012 State of the Union Address, President Barack Obama addressed the rising cost of higher education in the United States. Through an executive order in 2011, President Obama laid out a student loan plan, “Pay as you Earn,” that allows former students to pay education debts as a percentage of their incomes. Furthermore, the Obama administration has developed a standardized letter to be sent to admitted students indicating the cost of attendance at an institution, including all net costs as well as financial aid received. Use of the letter is not mandatory.Research has shown that since the year 2012 student debt has gotten worse. ^ Campbell, Robert; Barry N. Siegel. "The Demand for Higher Education in the United States". American Economic Association. JSTOR 1812115. ^ Lazerson, Marvin. "The Disappointments of Success: Higher Education after World War II". Sage Publications, Inc.: 64–67. JSTOR 1049607. ^ Hau, Wingfield (January 21, 2008). "The World's Most Expensive Universities". Forbes. Retrieved June 27, 2013. ^ Vasagar, Jeevan (January 21, 2008). "UK tuition fees are third highest in developed world, says OECD". The Guardian. London. Retrieved September 12, 2011. ^ "Freezing tuition: It's not such a hot idea". Los Angeles Times. 2012. ^ a b Phillips, Matt (2017-06-16). "College tuition hikes are finally slowing down". Vice Money. Vice Media. Retrieved 2017-06-21. ^ a b "Trends in College Spending 1998-2008" Delta Cost Project. ^ "Trends in College Pricing 2017" (PDF). ^ a b Luzer, Daniel (April 13, 2012). "Can We Make College Cheaper?". Washington Monthly. Retrieved 2012-04-17. ^ a b c d e Kantrowitz, Mark (2002). "Research Report: Causes of faster-than-inflation increases in college tuition" (PDF). FinAid. ^ Claudia Goldin, Lawrence F. Katz (2008). The Race Between Education and Technology. The Belknap Press of Harvard University Press. ^ Hillman, Nick (2006). "Student Debt Burden, Volume 3, Number 8, August 2006" (PDF). American Association of State Colleges and Universities. ^ "Federal Student Loans: Patterns in Tuition, Enrollment, and Federal Stafford Loan Borrowing Up to the 2007-08 Loan Limit Increase". gao.gov. 2011. ^ Lucca, David (July 2015). "Credit Supply and the Rise in College Tuition: Evidence from the Expansion in Federal Student Aid Programs" (PDF). Retrieved 30 August 2016. ^ a b Larson, Aaron (16 December 2017). "Student Loans in Bankruptcy". ExpertLaw.com. Retrieved 21 March 2018. ^ a b "Student Loan Bankruptcy Options". money-zine.com. 2011. ^ a b c Hamilton, Reeve (November 17, 2012). "Legislators Weigh Options for Tuition Deregulation". The New York Times. Retrieved June 27, 2013. ^ Darolia, Rajeev; Ritter, Dubravka (2015). "Do Student Loan Borrowers Opportunistically Default? Evidence from Bankruptcy Reform". FRB of Philadelphia Working Paper No. 15-17. SSRN 2592600. ^ Kiley, Kevin (2011). "Discounting the Bottom Line". National Association of College and University Business Officers. Inside Higher Ed. Retrieved 28 June 2013. ^ a b c d Willie, Matt (2013). "Taxing and Tuition: A Legislative Solution to Growing Endowments and the Rising Costs of a College Degree" (PDF). Brigham Young University Law Review: 1667. Retrieved 19 July 2013. ^ a b Kantrowitz, Mark (2002). "Research Report: Causes of faster-than-inflation increases in college tuition" (PDF). FinAid. ^ "Affordable Higher Education: Student Debt". U.S. PIRG. 2011. Retrieved June 27, 2013. ^ "Fight to Protect Students and Taxpayers Moves to Senate! - House Voted to Slash Pell Grants and Block Gainful Employment Rule". ProjectOnStudentDebt.org. 2011. ^ Brooks, John (2016). "Income-Driven Repayment and the Public Financing of Higher Education". Georgetown Law Journal. ^ Applebaum, Robert (2009). "The Proposal". ForgiveStudentLoanDebt.com. ^ "Real Loan Forgiveness". ProjectOnStudentDebt.org. 2011. ^ "Take Action for Real Loan Forgiveness!". ProjectOnStudentDebt.org. 2009. ^ Collinge, Alan (2011). "Private Student Loan Bankruptcy Bill... The 4th Attempt". StudentLoanJustice.org. ^ "Bankruptcy Relief for Private Student Loan Borrowers Advances". ProjectOnStudentDebt.org. 2010. ^ a b Collinge, Alan (2012). "Why College Prices Keep Rising". Forbes. ^ Collinge, Alan (2011). "Tuition inflation: How the Unique Absence of Consumer Protections causes College Prices to Rise". DAILY KOS. ^ Collinge, Alan (2012). "What Congress Can Do To Solve the Student Loan Crisis". NY Art World Commentary. Archived from the original on March 27, 2013. ^ a b Watts, GordonWayne (4 August 2016). "A Polk Perspective: Fix our bankrupt policy on student debt". The Ledger. Retrieved 19 August 2016. ^ "Affordable Higher Education: Cutting Lender Subsidies". U.S. PIRG. 2011. ^ Kantrowitz, Mark (11 January 2016). "Why the Student Loan Crisis Is Even Worse Than People Think". TIME. Retrieved 19 August 2016. ^ "Commission: Private Loans are Not the Solution!". ProjectOnStudentDebt.org. 2006. ^ Hensley-Clancy, Molly (May 22, 2014). "How A Private Foundation With Student Loan Ties Became A Force In Higher Education" – via Buzzfeed. ^ "Harmful Effects of Federal Student Aid: Dollars, Cents, and Nonsense". Center for College Affordability and Productivity. 25 June 2014. Retrieved 21 May 2015. ^ "Reflections on the underemployment of college graduates". Teachers College at Columbia University. 25 June 2014. Retrieved 18 January 2015. ^ Dynarski, Susan (Aug 31, 2015). "Why Students With Smallest Debts Have the Larger Problem" – via New York Times. ^ McCluskey, Neal (2012). "Reducing Federal Aid, Not Changing Bankruptcy Laws, Key to College Affordability". CATO Institute. ^ "Commission Calls for "Reduced Debt Burden" -- Time for Education Department to Act". ProjectOnStudentDebt.org. 2006. ^ Data sources listed in Uebersax, John (2009-07-15). "College Tuition: Inflation or Hyperinflation?". Retrieved 2009-07-15. ^ Salam, Vance H. (2012). The College Cartel. National review Online. ^ OECD (2013). "Education at a Glance". OECD White Papers. ^ Hopper, Briallen and Johanna. "Should Working-Class People Get B.A. 's and Ph.D.'s?". The Chronicle of Higher Education. Retrieved March 29, 2012. ^ Barrow, Lisa; Cecilia Elena Rouse (2005). "Does college still pay?". The Economists’ Voice. 2 (4): 1–4. ^ Luzer, Daniel (February 18, 2011). "Why Students Drop Out". Washington Monthly. Retrieved 2013-02-16. ^ May, Ross; Stephen Casazza (1 June 2012). "Academic Major as a Perceived Stress Indicator: Extending Stress Management Intervention". College Student Journal. 46 (2): 264. ^ "Higher Ed NewsWeekly (p.57)" (PDF). Illinois Board of Higher Education. 2007. ^ "Student Loan Debt Drives Man to Suicide". Newsalert, citing The Chicago Sun-Times. 2007. ^ Lewis, Libby (2007). "A Pastor's Student Loan Debt". NPR. ^ Collinge, Alan (2007). "Company's march toward student loan monopoly scary". TheNewsTribune.com. ^ Guo, Yuh-Gen; Wang, Shu Ching; Johnson, Veronica (2011). "College Students' Stress Under Current Economic Downturn". College Student Journal. 45 (3): 540. ^ Jones, J. (2010). Advocates urge quick action on rules governing for-profits: Institutions account for 10 percent of enrolled U.S. college students but 44 percent of student loan defaults. Diverse Issues in Higher Education, 27(12), 7. ^ a b "National Student Loan Two-year Default Rates: FY 2010 2-Year Official National Student Loan Default Rates". U.S. Department of Education, Office of Student Financial Assistance Programs. 2012. Retrieved June 27, 2013. ^ United States Senate. (2010). Emerging Risk? : An Overview of Growth, Spending, Student Debt and Unanswered Questions in For-Profit Higher Education. Washington, DC: U.S. Government Printing Office. ^ Lewin, Tamar (2011). College Graduates’ Debt Burden Grew, Yet Again, in 2010. The New York Times. ^ Dvorkin, Howard (2010). "Student Loan Debt Surpasses Credit Card Debt-What to Do?". foxbusiness.com. ^ Harkin, Tom (18 October 2012). "Make College Costs More Transparent". TIME. Retrieved 31 March 2013. ^ Guo, Yuh-Gen; Wang, Shu-Ching; Johnson, Veronica (2011). "College Students' Stress Under Current Economic Downturn". College Student Journal. 45 (3): 537. ^ Nakamura, David (October 26, 2011). "Obama moves to ease student loan burdens". The Washington Post. ^ "Government Gives Colleges a Model for Telling Students About Costs". The Chronicle of Higher Education. ^ Berman, Jillian. "Student debt surpassed $1 trillion four years ago today. Here's why it's still growing". MarketWatch. Retrieved 2018-09-17. This page was last edited on 31 March 2019, at 15:39 (UTC).